After all the fun of watching Solo – A Star Wars Story this week, we had incredible fun recreating all our favourite parts with the new Kessel Run Millennium Falcon from Hasbro. First things first this toy is big. Its a big ship. So thats the first plus from the boys, when it comes to toys and vehicles its usually the bigger the better with my two. Luckily even though its big theres hardly any assembly. Theres a few flaps and bits to clip on but not much. However there are a few fiddly stickers to negotiate. Not having the best dexterity, and suffering from close up double vision at the moment my placement of the stickers was not great. I did my best and its not too bad. I really detest putting the fiddly stickers on toys. This is one job that I just wish would come already done. Thankfully once the stickers and plastic flaps are attached your all ready to rumble, and I mean that literally. One of the big draws of the Kessel Run Millennium Falcon is all the amazing lights, sounds and rumble effects you get whilst playing. Final third press makes you enter Hyperspeed, so more lights and sounds and then with a final flourish the blast panels at the back and the front fly off spectacularly. As well as all the great lights and sounds, and the aforementioned surprise blast panels. Theres lots more to discover. It comes with the Kessel version of the Han Solo Forcelink 2.0 action figure, which looks awesome in all black. The front of the ship houses the removable escape craft with moveable cannons that Han can use to escape the bad guys. Theres also a secret smugglers hatch which houses a container of Coaxiam, that becomes visible when the blast panels blow away. A massive part of the new Millennium Falcon is it’s Forcelink 2.0 connectivity via Bluetooth. When you scan over a Forcelink compatible action figure whilst wearing the Forcelink on your arm, the figure will activate authentic phrases and sounds from the movies. If you have multiple figures they can respond and interact with each other. When you use the Forcelink 2.0 App on your smartphone, you can level up the characters you own and unlock new phrases and sounds. This all sounds really awesome and i’m sure kids everyone will get a real kick out of making Han and Chewie talk to each other, or getting Luke and Darth Vader to interact with sounds during an epic play session. We have had some great fun playing with the brilliant Kessel Run Millennium Falcon, and highly recommend it to young Star Wars fans throughout the galaxy. Thanks so much to the Hasbro Toy Tribe for letting us review this product. Unfortunately my camera has decided not to play and I couldn’t get any photos or video of us playing with our latest toy. Even I let out a little squeal of delight when I got the email from the Hasbro Toy Tribe that we’d be receiving a brand new Furby Connect to review any day, and now here he is. His name is Doo-Doh, which translates as Lazy Tummy in Furbish. I’ve always loved Furby’s ever since I was a little girl, but never got one originally first time around. I had to wait until Jacob asked me for a Furby Boom last birthday until I got my hands on one in real life. Obviously I let him play with it first. 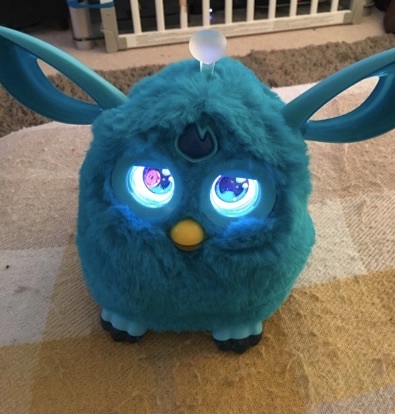 Even though we did love our Furby Boom, it’s great to upgrade to the Furby Connect as it is so much cooler. However the biggest advantage has to be that Furby Connect comes with an eye mask for putting it to sleep. No more phantom furbish waking us all up in the middle of the night, thank god. Furby Boom never did sleep properly. It was a case of taking the batteries out if you needed to keep it quiet, which gets annoying. So the sleep mask is a simple but very welcome solution. 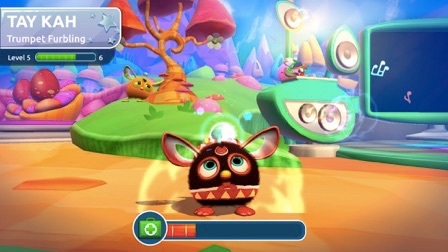 The main change you’ll see in the new Furby connect is the huge LCD eyes, which have a great way of interacting with you. When he’s hungry or your feeding him with the food cannon, you can see the food floating across his eyes. You’ll also see musical notes when he’s singing and other things too. It makes the Furby seem so much more real as the LCD eyes are so expressive as it talks. As usual Furby has a great personality and sense of humour, but Furby Connect has really been turned up all the way to eleven as he’s so sassy and funny. The boys and I have just laughed and laughed at some of the things Furby has said. 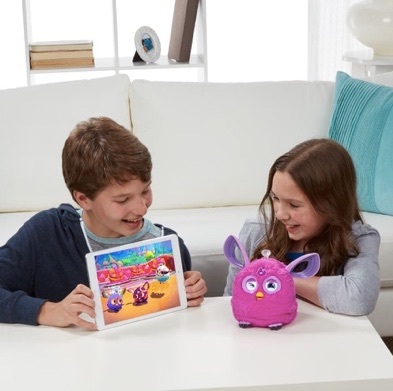 One of the great ways you can interact with Fuby is via the new app Furby Connect Worlds. Here you can hatch little virtual furblings, and clean them, feed them, play with them and level them up as you go along. In the app you can also do one of our favourite things with Furby Connect, watch videos together. We have watched music videos of real current hit songs where Furby sings along and fun videos of things like nanna’s drumming and little kids doing karate. Think of it like watching Youtube with your Furby but with only very young kid appropriate videos coming up. Plus Furby talks all over the videos, so its like your watching and interacting at the same time. I loved that about 10 minutes after we’d watched the karate kid video Furby said “AWW remember the nunchuck kid video that was so awesome” It really made us all laugh. 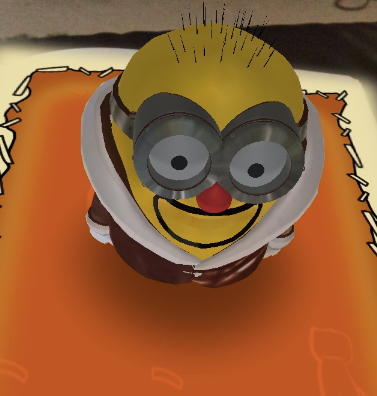 The good thing with the Furby Connect Worlds app is that you don’t have to use Furby at the same time if you don’t want to. Theres always Furblings to clean, eggs to hatch and so on, but this means that while your out and about with Furby at home you can still do all the other things with your Furblings and theres always something to entertain and keep your little ones busy. It’s also worth mentioning that Furby connects to your phone or tablet via Bluetooth, so everything really simple. I know that we had a lot of trouble at times connecting our old Furby Boom to the app, but no such problems this time. The new Furby Connect Worlds app is simple to use, as I said no connectivity problems with Furby Connect, and is most importantly really fun to use. Being connected wirelessly via Bluetooth means that Furby Connect will update periodically when your in the App, so the videos change and Furby will learn new songs from the charts. He even knows what time it is, so will ask for breakfast or lunch, plus even knows what day it is- for example a special day like Christmas Day or Valentines Day. And lastly having two boys I cannot fail to mention the laugh out loud fun they have had putting Furby over the virtual toilet and helping him push something out. Will it be a truck, a pineapple with a banana face or maybe just a big poo, the possibilities are endless. Everytime I hear Furby shout “The Struggle is real!” I know there putting Furby over the toilet again. 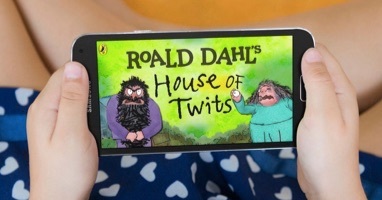 This week we’ve been playing around with the highly amusing new app ‘House of the Twits‘ from Penguin Random House. Obviously based around the hideously foul Mr and Mrs Twit from Roald Dahl’s famous ‘The Twits’, it’s full of deliciously anarchic fun. Jacob’s been the one playing it the most, as it’s entirely his sense of humour, and he finds it hilarious. Pulling out Mrs Twit’s glass eye, feeding the pair hideous food like mouldy cornflakes and Worms, surprise parcels with pranks to play on the Twits. Truly disgusting stuff that kids will lap up. 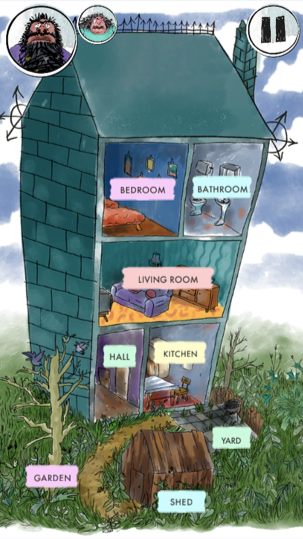 It’s great fun to navigate around the Twits hideous house. Causing mischief waking up Mrs Twit in the Living Room, and dishing up that disgusting grub in the Kitchen. At first only Mrs Twit and the Kitchen are available to play, but you unlock more rooms the more you play. With Mr Twit playable from level 10. However it’s not hard to unlock the extra levels, and you’ll be rooting around Mr Twit’s beard in no time. After our previous fun with the Crayola Colour Alive Mythical Creatures colouring book, we were thrilled to be sent the new Crayola Colour Alive Minions set. Crayola Colour Alive is a series of colouring books complete with special marker pens. When coloured you can scan your pictures into the free app which then magically pops them off the paper and onto the screen. As you can see from the picture opposite, it really does look like your coloured image has come to life in front of you. You can have great fun taking pictures with your coloured creations. 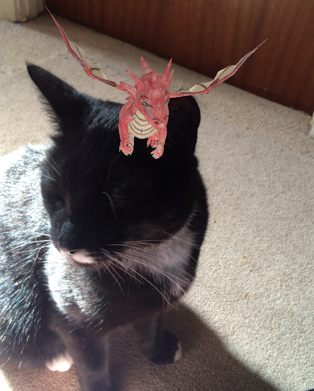 In our last few we had a few problems with the app responding, but these seem to have been fully resolved in the latest update as we had no problems at all. 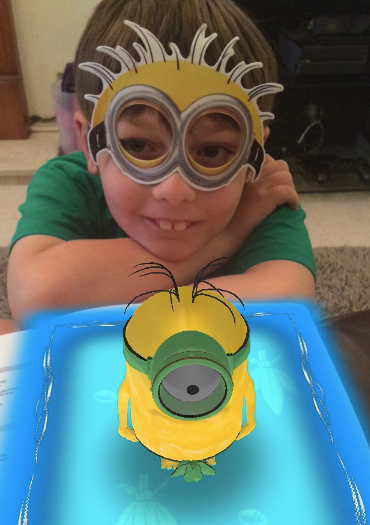 As well as taking pictures with your new friends, you can also use the app to add more colour or special effects like glitter or for the Minions their favourite Bananas to your creations. Here a few other pictures that Jacob coloured in and we played around with in the app. 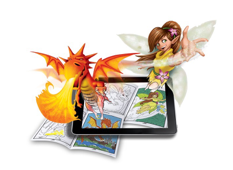 Crayola Colour Alive is a great way to get your gadget loving kids creative with pen and paper again. Best of both worlds if you like. We’ve had great fun with both of the Crayola Colour Alive books we used, so am definitely going to be on the lookout for some new ones. Disclosure: We were sent this Crayola Colour Alive book to review. All opinions are our own. Easter holidays, and the boys have been getting creative and testing out the new Crayola colour Alive colouring books. With Colour Alive you can see the images you’ve coloured in actually pop out of the screen and into your living room. Which is actually really neat. As with most things nowadays there’s an app you’ll need to download. The system works by scanning and recognising the special Colour Alive marker you have used. Each book comes with 7 Crayola Markers, but only one unlocks the special virtual reality pictures. With the two colouring books we had to review, the red marker unlocked the magic in Mythical Creatures, and it was the yellow in enchanted forest. Once you’ve found the special colour you need to simply scan it in the Colour Alive app. Then you can scan in your colouring pages and watch as the pictures appear to come alive. Annoyingly at the moment it seems that the app is having a few problems on certain devices with scanning the coloured in pictures. However if you scan an uncoloured page and then colour it in the 4D effects will work. 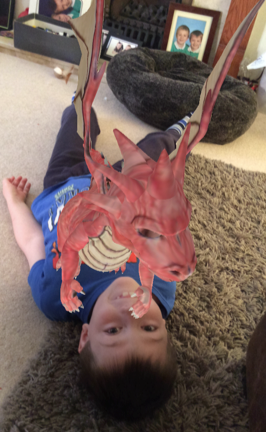 Once we figured things out and released that our virtual dragon was located in the “my saved stuff’ section, we got to work taking some virtual selfies with our works of art. Even Harry the cat got involved. To celebrate Colour Alive being at the Gadget Show Live there’s actually a competition running this week, for the best Colour Alive Selfie with an amazing prize. If you have a Colour Alive set you can enter by tweeting #colouryouselfie and your picture, and if you get to see it at the show you can try it out and enter there. Disclosure: We were sent some Colour Alive sets by Crayola to review. All opinions are my own. Jibbitz – those fun little charm accessories you can use to customise your crocs, have just got even more interactive. Jibbitz have added Zappar technology to four new packs, enabling you to zappar your pack and use your new charms virtually as well as physically wearing them. 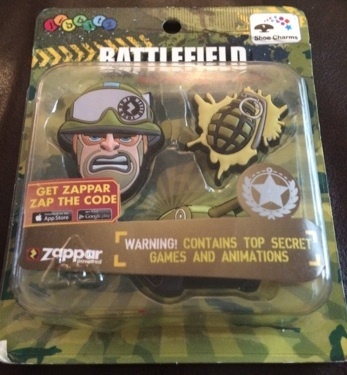 The New packs with Zappar technology are Battlefield – where you challenge Sarge in a paintball game, Pet Salon – Which lets you preen your lovely kitty charm, Race Benny with the Racing Car pack, and lastly take your picture with your beautiful butterfly charm in the Fairy Land pack. We tested out the Battlefield pack – Perfect for my two boisterous boys. After launching the Zappar app on my iPhone and Zapping the code on our pack, suddenly Sarge popped onto the screen out of nowhere barking orders. The best part obviously though is the paintball mini game. Sarge appears in a tank and proceeds to launch paint at you, you have to dodge the paintballs by correctly clicking where the paint will land. If you don’t you’ll end up covered in paint, and it’s three strikes and your out. It’s a fun added extra to your pack of Jibbitz, and eveytime Jacob sees the Sarge Jibbit it reminds him of the game and he wants to play it again. The only problem I have is that the app won’t remember the Zappar code, so make sure you keep the pack if you want to play the game again. You can press on Sarge’s head and he does a few different animations. Jacob’s favourite is when steam comes out of his ears and he then blows up and emerges covered in paint, he laughs and laughs every time. The zappable Jibbitz™ charms are available now in both the UK and the US through Crocs stores and Crocs online, priced at £6.99/$7.99. All new Zappar Powered Jibbitz for Crocs from Zappar on Vimeo. Disclosure: We were sent a pack of the Battlefield Jibbitz in order to write an honest review. 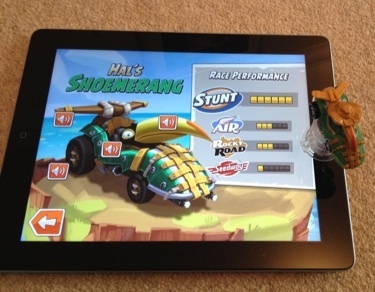 Last week I caught my first glimpse of the new Angry Birds playlets from Hasbro – Angry Birds GO! Telepods at Dream Toys, and was really impressed. I was then sent a review sample of the Dual Launcher set, so here’s mine and the boys thoughts after playing with it for a few days. First of all I like the way that the sets are essentially 3 toys in one pack, as you can use all the components to play in different ways. Firstly the Telepods. Telepods are Hasbro’s newest gaming gadget. Using Telepod figures, you can beam them into your mobile games on your Androids and iPad’s. 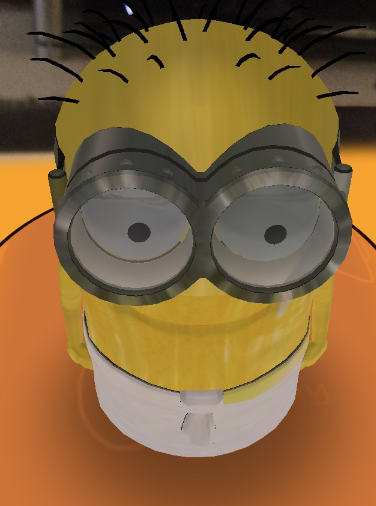 You do this by placing the Telepod’s figure on the transparent base and then over your devices camera. The app then reads the QR code on the underside of the figure and unlocks that character in your game. As Angry Birds GO! isn’t actually released yet, but the Telepods sets are, you’ll need to download the Angry Birds Go! Countdown app to give your Telepods an early try out. We did just that and the boys watched excitedly as the Boomerang Bird figure appeared on the screen in his Shoemerang car. At the moment in the countdown app you can only upgrade your car’s and levels, so were all anticipating racing in the Shoemerang car as soon as the proper game launches. 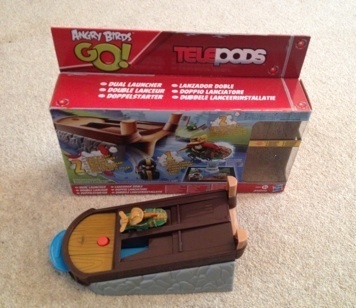 The Telepod figure was easy to use, and instantly recognised by the app. No problems syncing or finding the figure. Very smoothly done. The great thing about the Telepods range is that although you would think with all of this technical gadgetry they were only for use with your app’s, they are also great toys in their own right. Aside from the kart sets which are available, there are two Angry Birds Go! playsets available – Pig Rock Raceway and the Dual Launcher Racing Rivals. Both are purchased separately, but if you do have the two you can join them up together to make a bigger playset. Pig Rock Raceway comes with two karts plus the racetrack and a standard launcher. The Dual Launcher comes with a fancier Slingshot launcher but only one kart. The Pig Rock Raceway comes with everything you need for an Angry Birds Go! kart race, the two rival karts and a 40 inch long track with finish line. The Dual Launcher only comes with the launcher and one kart, no track. However the great thing with the launcher is that you can use it with any of the other previous Hasbro Angry Birds sets you may have, like we did with the Angry Birds Star Wars sets from last year. Using the Dual Launcher instead of the slingshot launchers was a lot of fun, and a great way to reinvigorate those old sets. You can see how we set them up and used them on the short video below. I think you could use the blocks in the same way with the Pig Rock Raceway, building huge bridges over the racetrack and seeing if they could be knocked down as you race. It’s a great way to get added value out of your sets, and means they are not simply fancy plastic figurines just for adding the character to the apps. They are worthy toys in their own right. I can imagine that if your child wanted to collect the whole of the Telepods Angry Birds Go! Karts it could very get expensive, but I would feel happier in buying them the playsets. You still get some of the karts, but if you have extra blocks and characters from old sets your children will get lots more use from them. Disclosure: I was sent a review copy of the Angry Birds Go! Telepods Dual Launcher in order to write an honest review. Cut the Rope and Om Nom have been really busy this summer holidays keeping Jacob occupied during car journeys, hairdresser and dentist appointments, and the long wait at the shoe shop when getting the new school shoes. When not playing with the App on his iPod touch, he’s been having a candy crunching time with the brand new Candy Monster Om Nom we were sent last week by Vivid Toys and Games. Whilst not described as a talking Om Nom, he talks as much as you can expect from an Om Nom. Chomping, Munching his way around the house. The coolest thing about this new Om Nom is the pull-able candy in his mouth. When you pull out the Candy sweet Om Nom will shuffle along on his bottom trying to retrieve it. If you only pull the candy out slightly Om Nom will move and Chomp along, but if you pull it all the way out you get the added excitement of some music from the App too. Amazing! 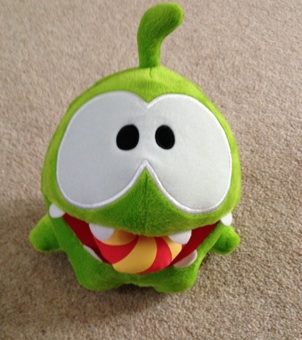 We’ve been lucky enough to have another plush Om Nom which we reviewed a few months ago that’s been used in many games, but the new Candy Om Nom’s noises and sounds have definitely pushed him in front when it comes to playtime. The boys just love his wobbly bottom shuffle. If you’re looking for a bit more Om Nom fun then head over to your local The Entertainer Toy Store and check out when they are running an Om Nom Treasure hunt. Every Entertainer store in the UK is going to be running one. Kicking off on 29th August and running until 18th September. A few weeks ago I got an opportunity I really couldn’t turn down – I got to go to Microsoft Soho Studios in London and test out a brilliant new way of interacting with my Tv using the Xbox 360 and Kinect. Me and two other bloggers ( Nova from Cherished by Meand Joanne Mallon, of Opposable Thumbs) were part of a group of bloggers from Tots100 who were lucky enough to have a private session at the studios to teach us all about Xbox Kinect 2 Way Tv Experiences. 2 Way Tv is a really interesting concept. Initially rather than a game it starts off looking like a traditional TV show, but suddenly the show starts talking to you and you in turn can really interact with it. Immediately it evolves from simply something you watch, into something you can actively take part in. The two games that use this technology that we were shown were Sesame Street TV and Nat Geo TV. We also got given some Microsoft points so we could download them when we got home to see what the rest of the family thought. Seeing my two boys Watching and playing Sesame Street TV is a real pleasure. I’ve always missed the traditional Sesame Street TV shows that I used to watch when I was growing up. Brilliantly the episodes on Sesame Street Tv are exactly what I’ve been missing from my childhood, but brought slap bang up to date for the current generation of kids. Being very competent gamers, both Thomas and Jacob are well used to playing Kinect games, and I think when I suggested watching these new Kinect Tv episodes they were expecting the usual character moving around on-screen and copying your movements. They were totally stunned almost immediately when the character asks you to stand in front of the onscreen mirror and changes his t-shirt so it’s the same colour as yours. This was only the beginning however, they spent the next 20 minutes of the episode throwing things to the characters, shouting answers at the screen, and dancing around in magical Elmo’s world. The episodes are worth it just for the 5 minutes of Elmo’s world alone. If you’ve ever seen Elmo’s world it’s based around Elmo living in a cartoon house drawn by crayon, very whimsical and simply anything can happen. Somehow the game creators have managed to expertly capture the feel of the show into these sections. It’s so hard to explain what happens, so it’s probably best you watch the video below to see what I mean, but it’s truly magical and definitely my sons favourite part of all the episodes. There is one main aspect I love about the whole Sesame Street Tv concept the most. It’s exactly like a kids tv show, but 100 times better. 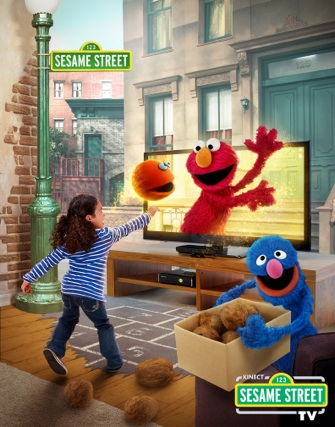 Rather than being just a Sesame Street game, it’s really just like a show. You get to know all the segments, all the presenters. 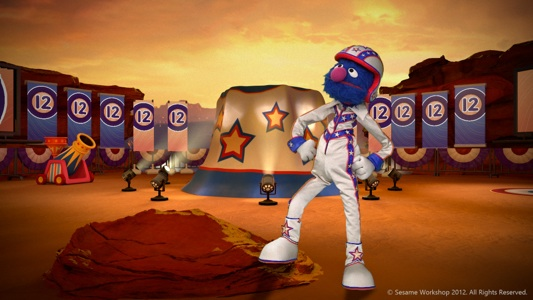 First comes the introduction then you’ll have a piece on something, then a song, then Grover, and always Elmo’s World near the end. Having that continuity between all the episodes enhances the whole series so much. Kids love knowing whats coming next, and what to look forward too. Nat Geo Tv is the same concept as Sesame Street Tv but as it’s aimed for slightly older children its a bit more grown up. Don’t get me wrong it’s lots of fun and you still get to mess around, but this time rather than jumping into Elmo’s World you get to become a bear and pretend your fishing for Salmon. The shows are much more information filled, and it does feel exactly like your watching a normal Nat Geo documentary with a few of the Kinect photo challenges thrown in. We found that the Sesame Street TV episodes are great for when the boys are full of beans and ready to get active, but the Nat Geo TV shows are perfect pre bedtime viewing. Theres enough interactive elements to keep even my youngest interested, but the beautiful scenery and wonderful animal helps everyone calm down after a long day. Out of the two I would say that Sesame Street TV was our favourite , however that is probably due to the younger nature of my children. If you have a wildlife mad son or daughter who loves things like Nat Geo and Deadly 60 then Nat Geo TV would be the best thing ever. There are two ways that you can get these 2 way tv experiences for yourself, by either downloading or purchasing them on disc. Like Tv shows Sesame Street TV and Nat Geo TV are released in seasons. There have been 2 seasons of both so far. Season one of both games are available to buy on disc in stores. However it’s easier if you download either the individual episodes or as a Season Pass on your Xbox. Season 2 of both are only available to download as a Season Pass or individual episodes, not on disc as yet. The Season Pass’s cost 2400 Microsoft Points, and as mentioned there are 2 seasons of both games available. Individual episodes cost 400 points each, and there is even a free episode of each to try. If you go for one of the Season passes of Sesame Street TV you also get access to indulge in the massive library of clips from the show. Theres both classic and contemporary clips to enjoy, and it’s much easier to navigate and find great clips than searching on YouTube. You can even stack the clips into a playlist and make your very own episode to watch. My personal favourite clip has to be Ricky Gervais singing the Celebrity Lullaby to Elmo, it had us all in stitches. I like to think of myself as quite a tech savvy gamer, and up to date with most things, but I have to admit that even though both the Sesame Street TV and Nat Geo TV are both in their second season now, they were totally off my radar. I am so glad I got the opportunity to try them out at the studios, and that I get the chance to let you all know how great an experience they are. I compel you to try the free episodes out for yourself as it’s really hard to convey how new and original the episodes feel in writing, they simply need to be played. Those Blue Nose Friends of Tatty Teddy fame have a brand new app for the iphone, iPod Touch, and iPad. Tatty Teddy doesn’t actually feature in this game though, it’s all about Tatty Puppy and his friends. We tested out the new app on the iPad. The App starts with Tatty Puppy jumping through Tatty Teddy’s wardrobe and going to see all his Blue Nose friends. It’s made up of 6 mini-games, each hosted by one of the Blue Nose gang. When you click on one of the friends you’ll be taken to their game page. There is also a jigsaw puzzle on each page, and you unlock pieces as you play their game. When completed the jigsaw will tell the story of Tatty Teddy meeting that Blue Nose Friend, both in pictures and being read out loud by the narrator. Each game is very different, and I loved the variety in gameplay. The App has been really well done. Blossom’s Skip and Jump – Help Blossom jump over the skipping rope by tapping the screen at the right time. Double tap to make Blossom jump higher and collect treats. A simple but effective little game. 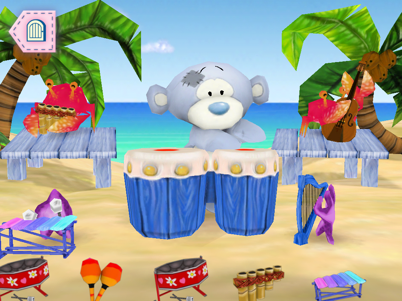 Coco’s Beach Band – Make some funky music with Coco the Monkey and his seaside pals. Add and take away instruments as you please to see how the music changes. Steel Drums, Violins, Harps, Maracas and much more available to play with. This is Jacob’s favourite of the games. Passion’s Magical Garden – Help Passion the Butterfly tend to the garden. Get creative as you first plant and water the seeds, then decide which colours you want your flowers to grow. Cottonsock’s Card Match – Remember where the cards are, all featuring your favourite Blue Nose Friends. It’s a game for either 1 or 2 players, and has 3 different difficulty levels. Harder levels mean more cards – 12 cards being the most. If you play with 2 players you get to choose a Blue Nose Friend to be your player icon. Blinky’s Hide and Seek – This one is my pick of the bunch. Even I think this one is pretty cool to play. In this game you play hide and seek with Blinky, and have to find her by moving the iPad around and tapping various places where she may be hiding. You actually have to move the iPad around quite a bit, very much like Face Raiders on the 3DS. If you’ve ever played that you’ll know what I mean. Very fun. Peanut’s Biscuit Bake – Another brilliant little game. Help Peanut in the kitchen create some gorgeous biscuits. Roll the dough, cut the pattern out, and then wait as they bake. Once cooked you decorate your biscuit with icing and sprinkles as you wish. When you’ve finished your culinary masterpiece you can take a photo of your creation. This was the first biscuit we made, a Passion one. The most important feature of the App is that there is absolutely no in app purchases or adverts. So parents can happily let their child sit down and play, safe in the knowledge that no large bills are going to be racked up. Also just as importantly there wont be any inappropriate content to view, which can sometimes happen by clicking on ads and travelling outside of the app. Blue Nose Friends Tatty Puppy is a brilliant all round app for little ones. Containing 6 games that in my opinion would be worthy of 6 individual Apps of their own, such is the quality of the games. 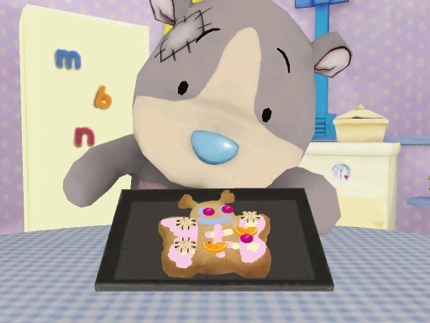 Blue Nose Friends Tatty Puppy is available from the App store for the iPhone and iPad as a free game containing Peanut’s Biscuit Bake, or the full version containing all 6 games for £1.99. An Android version is due to be released in July.